Beading Arts: Beautiful Czech glass beads giveaway! Picking a favorite bead is like picking a favorite child - impossible. But in the spirit of this giveaway, I'll force myself! I've changed my mind several times, browsing the website! I love "30pcs Dark Red with Marble Stone Coating Squares Picasso Table Cut Beads 10mm" - so gorgeous! Thanks for the chance to win! Definitely the 'Table Cut Beads" but I love the rectangles 'cause she has them in so many colours... I'm gonna say "Blue With White Waves", just 'cause I HAVE to pick, but they're all gorgeous! Hard to pick a just one. The closest I can get is any of the table cut beads. Especially the ones with marble stone coating. It's difficult to choose just one style from the shop, but I think the Copper Donuts Fire Polished Beads are amazing - I've never had seen anything like them. I've shared this great giveaway on my Facebook. My favourite style is the Copper Donut Fire Polished Bead. It's impossible to pick just one! But I will attempt. =) My favorites are the pressed flowers, and I am particularly fond of the 7mm scarlet ones, and the 16mm delicate violet ones. I have a hard time finding the bigger ones, and was delighted to find several colors of the 16mm ones! I had a hard time deciding between the triangular leaves and the twisted ovals. But there were so many more great beads, too. I'd probably change my mind every time I looked at their site. How can anyone pick just one? I guess if I have to I'll pick the Copper Fire Polished Beads. They're fantastic. I forgot to leave my email. It is koudryjatyahoodotcom. I love the Czech glass buttons do they count as beads? If not I love the daggers too, I have been making a lot of pieces with a student and using daggers. Although it's hard to decide because I use a lot of firepolish as well. I can't do it, I can't do it, I can't do it! I have been staring at her site for almost an hour, and I can't pick my fav. They are all BEAUTIFUL! I love the rounds, donuts, squares, table cut, picasso, flowers, leaves. Help! Pretty please count me in on this amazing giveaway! Thanks! I am currently on a copper kick so I would say the copper douut fire polished or a peacock pressed copper bead. I just posted it on my Facebook page for all my beady friends! I really liked the milky white bicones. Bicones work better with my Lampwork beads to stabilize the large holes used to make the beads. Great resource, I will revisit. I like the flower beads the best, although I agree with others that it is really hard to choose. i love using fire polish crystals the best but also the czech shapes are great. i use so many when making beaded christmas deocaration. I have my favourite colours (amethyst/olive green/gold) but my favourite finish is mixing some AB with matte finish for an interesting christmas decoration. I also love the new picasso beads and have a few that i picked up recently at a craft fair. they were expensive for me so precious to use. Thank Ekaterina for the giveaway. There are just too many beads to choose from. I like the matt lilac oval lampwork beads. I love the dagger beads. They look great as earrings. I have so many in my stash because everytime I see one in a new colour or finish I have to go and buy a few. 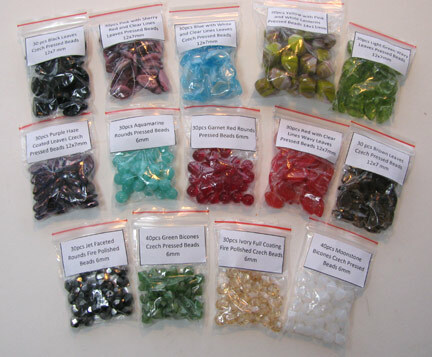 My favorites from the shop are any of the Czech seed beads. I was raised on them in my tribe and use mostly Czech seed beads. I also like the Picasso balls and the 2 way faceted Picasso fire polish beads. A beader can never have enough Czech beads. Thanks for the change to win a prize. I just blogged about your giveaway and then sent it off to another set of readers. My favorite is the white and green with Marble-Stone Coating Rectangles Picasso Table Cut Beads. They are gorgeous! Thanks, Debbie. Excited to be entered . Thank you for the chance to win. Well, it's really hard to choose, since I love Czech beads in general. But I'm on a fire polish kick at the moment, and when I saw these donuts, they really grabbed me! Thanks to you and Ekaterina for such a wonderful giveaway! It was hard picking just one favorite, but i finally decided on the 'delicate violet flowers pressed beads16 mm'. Love the variety in the glass beads and the colors, oh my! Czech beads are my absolute favorite! My current favorite style is anything with picasso finish. I love these http://best-beads.com/cz-beads-39/fire-polished/balls/35709.html. Hard to pick. I love the Picasso rounds and the rocallis seed beads. They are all amazing. Oh how I love Czech pressed glass. I was sure that was the category I was going to pick something from but after looking more my choice is the Rose Shadow Picasso Fire Polished Beads 6mm. I also like them in the deep blue. Thanx Cyndi and Ekaterina for this excellent giveaway. Hi Cyndi I tweeted about your great giveaway. I also posted to my blog about the giveaway. Thanks for having it. I like the matt lilac twisted oval lampwork beads. I love the Colour Mix with Oil Spots Short Daggers Peacock Pressed Beads. Will be fun to make some flowers with this daggers. It's really hard to decide. I love size 6 and 8 Crystal cut Czech beads when I'm making earrings. I also love anything copper and I love the Fire Polished beads. Too many decisions. My favorites are fire polished donuts and oval table cut Czech glass beads. I especially love the Picasso finish faceted fire polished donuts. I love this site as well as all the other sites I have found for beading. For me this contest opportunity presents a wonderful possibility, as a new to this field artist, to have some beads to add to my collection and further my beading "library". As others have said, I cannot choose just one style, for that matter even a few styles of beads, I love them all. My email address is monicajolly1001@yahoo.com thank you for this opportunity. I finally found the correct spot to enter the giveaway! Hoorah! Picking a favorite Czech bead is sooo hard. I like them all, especially the firepolished & lampwork. You have so many great beads! Thanks for opportunity to enter! I have bookmarked your shop. Hi Cyndi I just blogged about your wonderful Czech bead giveaway. I enjoyed MOST of the colors BUT especially "30pcs Gold Faceted Rounds Fire Polished Beads 8mm"
my email at home is not currently working so, unhappily, I'm using my work email 'cause I don't want to miss out on this contest...~! Your feedback: I love them all! My favorites are the seed beads,perfect,conform into everything I make with ease.And the variety of colors....Fantastic! Comment: I found you on Monique's blogspot, A Half-Baked Notion. I'm not sure if this is where I'm to leave the comment to enter the giveaway. I do love all kinds of Czech beads, especially the lampwork, fire polished, and table cut. Fabulous giveaway! I pretty much love all beads, but since I am being pinned down here (giggle) I would say the twisted ovals are one of my favorites. In browsing, even though you didn't ask, I like the moonstone and love the crystal with AB, Brown and Pearl coatings shown on the faceted rounds. Very very hard to pick just one so I narrowed it down to three! The rectangle table cut beads, the Picasso balls, and the props! But you cannot make me pick a favorite color! Thank you for offering this giveaway! I like the wavy leaves. Such pretty colors in your store. I agree with everyone who said it's so hard to pick just one favorite! It's a tie between the table cut rectangles (especially the cream with amethyst since I haven't seen that color before) and the table cut squares. So fun! My favorites are the "Violet with Gold Swirled Balls Picasso Fire Polished Beads 8mm". Picking them was not the easiest thing to do. Sooo many beautiful beads! So many beautiful beads!! My favorite have to be the Clear with White Flowers Handmade Flat Circle Lampwork Beads 20mm. They are so simple and elegant! Hi my name is Sara Miller. The Czech beads that I love are first the rocialles, short daggers, fire polished rounds, and the pressed flowers. But, really I love them all it is really hard to pick a favorite. Thank you for the chance to win. Good luck everyone.